Open Source Opportunities: Google Chrome Apps Launcher Misconception -- Launcher Icons Can Be Standalone Too! Google Chrome Apps Launcher Misconception -- Launcher Icons Can Be Standalone Too! Today, Google released a new category of apps previously known as "packaged apps", and they've now dubbed them as just "Chrome Apps", as announced on both Lifehacker and TechCrunch. Both articles state that a new launcher icon will appear in the task bar of Windows and, eventually, in Mac OS as well. However, for developers and application designers who strive for a more "standalone" user experience, this may appear as a shock. While those articles are factually true, the articles overlook one very important point: These apps also get their very own launcher icons that can be found in the Windows Start Menu and in the Mac OS Finder Applications folder. Under the hood, these launcher icons use a command-line startup flag called --app-id that takes the application id, found in the "Window -> Extensions" section of Chromium. When run, this command launches only the app, without starting a browser window. In Windows, and on Linux, it's actually a shortcut, but on Mac OS it appears to be a binary file. 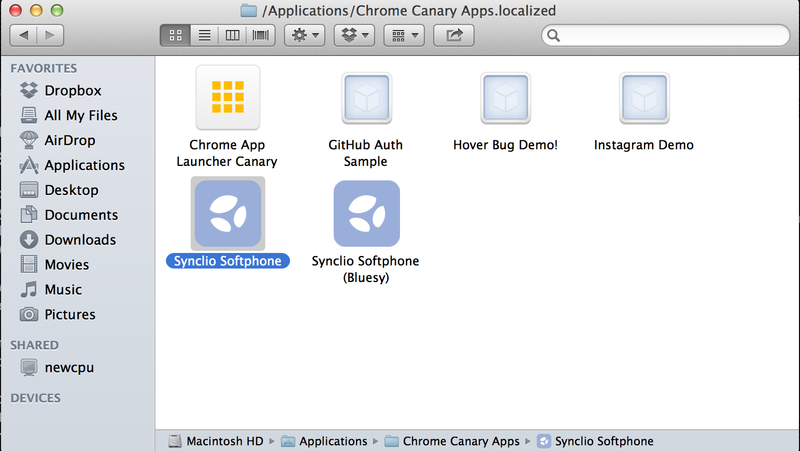 Below is an example of a few launcher icons from some example apps I've installed, as well as Synclio, the WebRTC VOIP Chrome application I'm building at work with our team. Perhaps this hasn't been announced because it's still in progress, but rest assured that Google and the Chromium team are diligently working hard to make sure that our apps will appear standalone, providing the user with a seamless user experience up to and including how the apps are launched. Excellent post!Hadoop is a framework which has four classifications in it. Each has different properties and apache hadoop is an open source software framework. It is used for distributed processing and distributed storage. It use handle large set of data and information.Thank you..!! Thanks for this blog. provided great information. All the details are explained clearly with the great explanation. Thanks for this wonderful blog. Step by step processes execution are given clearly.Know the details about different thing. Thanks for sharing the useful information with us. This information is impressive..I am inspired with your post writing style & how continuously you describe this topic. After reading your post,thanks for taking the time to discuss this, I feel happy about it and I love learning more about this topic. It is really interesting for me to read this article. Thanks for it. I like such topics and everything connected to them. Thanks for the nice blog. It was very useful for me. I'm happy I found this blog. Thank you for sharing with us, I too always learn something new from your post. Hello Thanks for sharing this information I really enjoyed reading this article. we are MGM Precision Machine Components Supplier if you are looking for any precision machined components for aerospace so pls visit us. Thanks, I’m really happy to see this interesting blog to read. I learned aways new information from your blog I like your way to write, you explain the topic, you are doing a great job. we are Adopt Pets Website if you are looking for any dog so please searching Adopt dogs near me website so pls visit us. Shraddha English is the leading spoken english institutes in hyderabad to learn Spoken English. It also provides English Speaking Classes to improve your Communication. Hello DEAR..Stores of a responsibility of appreciation is all together for this post.I think it is a predominant post. It helps colossal measures of us. Such a wide number of a wealth of a commitment of thankfulness is all together for this information. Interesting substance which encourages me to get the in depth information about the innovation. To know more details about the course visit this site. This is exceptionally useful and intriguing article.Nice to peruse your blog entry first time ever. I truly value this post. A debt of gratitude is in order for sharing this magnificent post. I am perusing your post from the earliest starting point, it was so fascinating to peruse and I feel because of you for posting such a decent blog, keep refreshes normally. A debt of gratitude is in order for imparting the helpful data to us. This data is impressive..I am roused with your post composing style and how ceaselessly you depict this point. Subsequent to perusing your post,thanks for setting aside the opportunity to examine this, I feel glad about it and I cherish becoming familiar with this subject.